Arnie and Ola Tait were presented with a bottle of champagne by excavation director Nick Card, of ORCA. 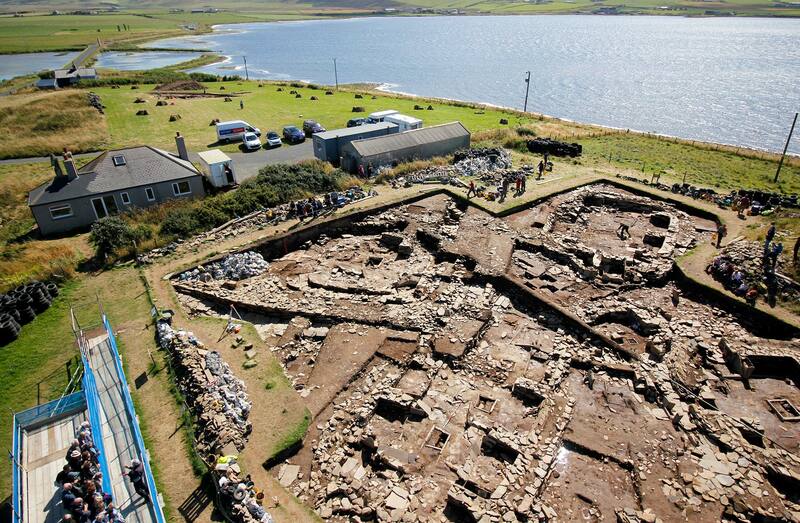 Welcome again to the Ness of Brodgar excavations. Another year has flown by and, once again all, the behind the scenes work has paid off – funds have been raised, the team assembled and the logistics finalised. And so we are here, day one of 2012. And what a year its been since we left you last August — the BBC History of Ancient Britain Special on the Ness broadcast on New Year’s Day; the gifting of half the site, including the house of Lochview, to the people of Orkney by an anonymous benefactor; and the site being awarded the Andante Travel Archaeology Award 2012, to mention but a few highlights, never mind some of the analytical results from post-excavation. The site has changed from last year, with soil heaps moved to improve public visibility of the excavations; the main trench extended with the aid of Vivian Flett’s JCB (to hopefully reveal the full extent of Structure Fourteen that was first exposed last year); a new footpath along the edge of the Loch of Harray to improve public access; and the viewing platform has already been completed ready for the anticipated influx of visitors. A sea of polythene at the start of Day One. Many new faces and several old faces have now assembled, given their site inductions and health and safety briefing and are now ready for the hard slog of pealing back the protective covers, removing several thousand stones that held the plastic sheeting in place, and lifting innumerable sandbags that help support and protect the stonework over the long winter months. So what can we expect this season? Judging by previous years, this is impossible to predict – who could have suspected the discovery of the use of colour both on pottery and walls, the stone slated roofs, the extensive use of art, or the scale and complexity of the buildings? So, as ever, watch this space for some new and amazing discoveries . . .
Polythene sheeting removed to reveal instantaneous archaeology. This year, to mention but a few objectives for 2012, we intend to further explore the floor deposits of the structures so far encountered — by XRF analysis and micromorphology (microscopic thin-sections studies); resolve the sequence of construction between the main buildings; and clarify the remodeling of several of the buildings (for instance, will Structure Ten, in its primary phase, be even more extraordinary than first predicted – difficult to believe!). This season we will, once again, be joined by a contingent from Willamette University in Oregon, led by Professor Scott Pike, who will be undertaking yet more XRF studies (chemical analysis) of the floor deposits in order to clarify how these structures may have been used. Dr Cathy Batt and Dr Zoe Outram, of Bradford University, will be taking archaeomagnetic samples from our numerous hearths to complement our radiocarbon dates and it is hoped that pot samples will be used to help develop the new and revolutionary RHX technique that allows ceramics to be directly dated. In addition, Dr Jo MacKenzie, also of Bradford, will take micromorph samples to help interpret how the floor deposits accumulated over time and complement the XRF results! I am sure, like the rest of the team, that you will not be disappointed with what is revealed! On the first day, Nick said “Let there be NoB”, and, about eight hours later, there was indeed NoB, derobed in all her glory. So began our season of excavation at the Ness of Brodgar. The last of the stones removed from covers. Today was our first day on site – a crack team assembled from all corners of the globe (from Adelaide, to Philedelphia, Canada to Orphir) – armed with work gloves and ready for the great unveiling. There was a buzz of excitement on site comparable to that of Christmas eve, with everyone eager to see what delights lay beneath the enormous tarpaulin of “gift wrap”, but also mindful that a lot of further preparation and hard work was required before the rewards could be reaped. And so, with all hands either on deck or beavering away behind the scenes, the Ness of Brodgar site was awoken from her winter hibernation. 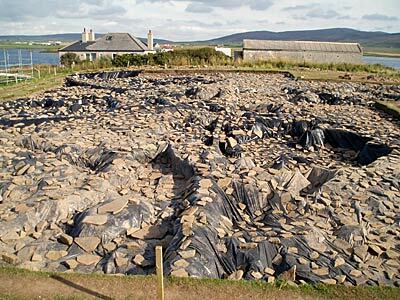 Each stone, sandbag and plastic sheet, laid down to protect the site from the Orcadian elements at the end of last season, was carefully peeled back by chains of eager hands. Today marked ten years of archaeological investigation at the Ness. 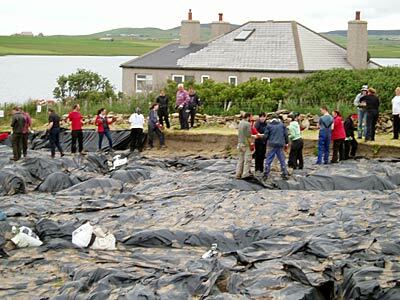 In 2002, the Orkney Archaeological Trust and Orkney College initiated the World Heritage Area Geophysics Programme, whereby the two fields overlaying the site were surveyed. In April the following year, a large notched and rebated stone was discovered, with excavation commencing from 2004 onwards. The rest, as they say, is history. 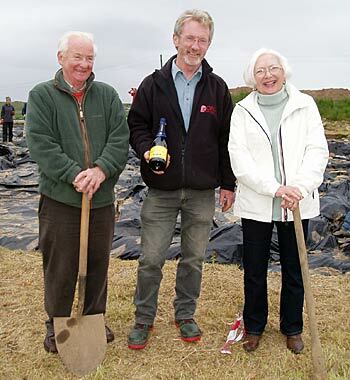 To celebrate the last decade of extraordinary discoveries, a little ceremony was held, presenting Ola and Arnie Tait (the very hospitable landowners of half of the site) with a bottle of champagne; all keenly documented by photographers from Radio Orkney. 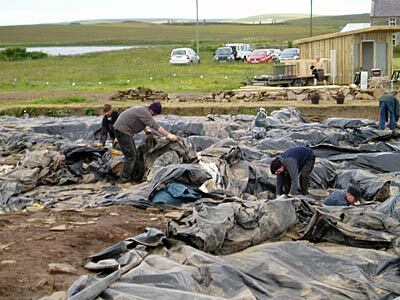 Elsewhere, the finds huts, supervisor sheds and Orkney Archaeology Society site gift shop are being assembled and their contents organised. The shop “shed”, courtesy of Beedies, is an even more impressive piece of real-estate than last year’s offering, and wouldn’t look out of place in a glamorous Swedish spa resort. It is soon to be filled with all sorts of tempting treats and souvenirs. Fingers crossed the jacuzzi and sauna are to follow – somehow I suspect not! Our already sizeable team (38 people strong at the last tea break) is composed of ORCA staff members, UHI lecturers, undergraduate and postgraduate students (such as myself) and willing volunteers from all sorts of interesting backgrounds. In addition, we have just been joined by a gaggle of builders gamely adding the finishing touches to the viewing platform which will accommodate the thousands of visitors anticipated over the duration of the dig. A handful of keen tourists have already popped over to see our progress, and have been met by a hive of activity and animated chatter beneath the afternoon sunshine. With the bright blue Orcadian sky reflected in the lochs of Harray and Stenness, it’s set to be a glorious summer of excavation.